Android by Google is one of the best most popular mobile operating system out there, it runs on lots devices such as Phones, Tablets, Computers, Wears - smartwatches, TV, Game consoles, Digital Cameras, Autos - Cars and other electronics. Although PC offers the best programming experiences with many programming software for PC like the Android studio - Android app development software. If you don't have a PC, your PC is unavailable, bad or stolen, creating apps on android or learning programming on android is very possible with the best programming apps for android which works fine on mobile phones and tablets, assisting you to create or learn android programming step by step even if you are a beginner in coding. So here is a rundown list of the best programming apps for android, which includes - best android apps to learn programming, best app builder on android. If you are looking for the best android apps where you can easily learn programming then this list is for you as it includes the top programming applications you can download for android, where you can learn how to make an app or how to make an android game, which builds your programming skills, by teaching coding for beginners. With Udacity app, you can easily learn programming as each lessons are broken down for easy assimilation for beginners in coding. You can access the Udacity app from anywhere anytime, you can also download the lessons to learn programming offline. While Udacity offers some programming course for free, you can can spend a little extra and go premium if you are interested to get the full features and services of the programming app like - Getting feedback from Udacity's top professionals and building connections with other students. 1. Learn from the best course materials developed with world-class industry experts from Facebook, Google, Amazon, Github, and more. 2. Thrive in an immersive learning environment that brings together leading academics and industry visionaries. 3. Learn on the go - anywhere, anytime as you can download lessons/books and content ahead of time for future offline work sessions. 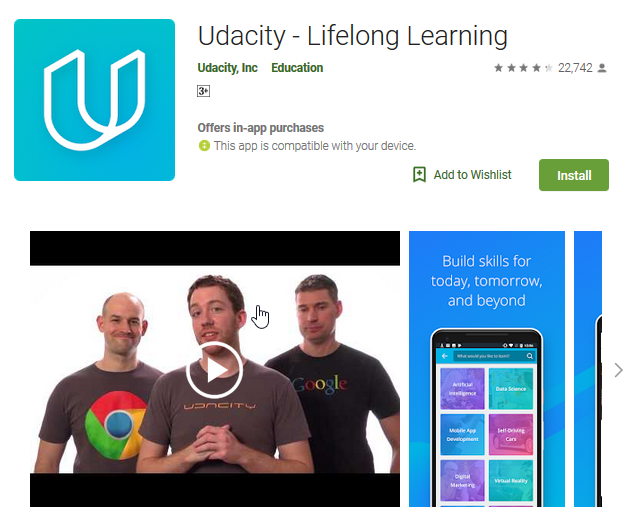 Download Udacity on Google Play store. Supporting over 5,000+ collections of programs in 17+ languages, Programming Hub is Google Play's 'Best Of The Best' of 2017. Easy to use and learn, Programming Hub is one of the best programming apps for android devices. Programming Hub is your best solution to learn all the top programming languages and technical courses, if you are looking to learn all the top programming language anywhere anytime using your android phone. 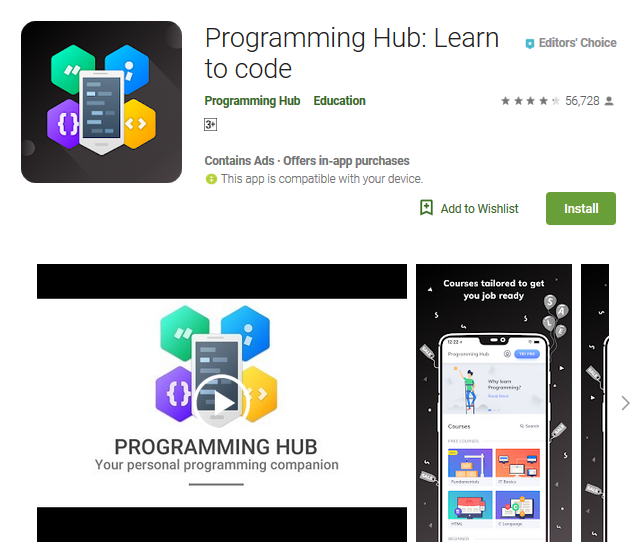 The programming learning app is created using deep research working together with Google's top experts, Programming Hub offers a perfect way to learn programming. In order to make the learning process easier, Programming Hub created precise course materials where beginners in coding will learn how to code like a pro easily, and also enjoy programming it like a game. 1. Learn how to code an app for beginners with over 5,000+ Hugh collections of programs with over 20+ courses and good examples of programs with pre-compiled output for quick reference and learning. 2. Recognized and Supported by Google launchpad accelerator. Download Programming Hub on Google Play store. 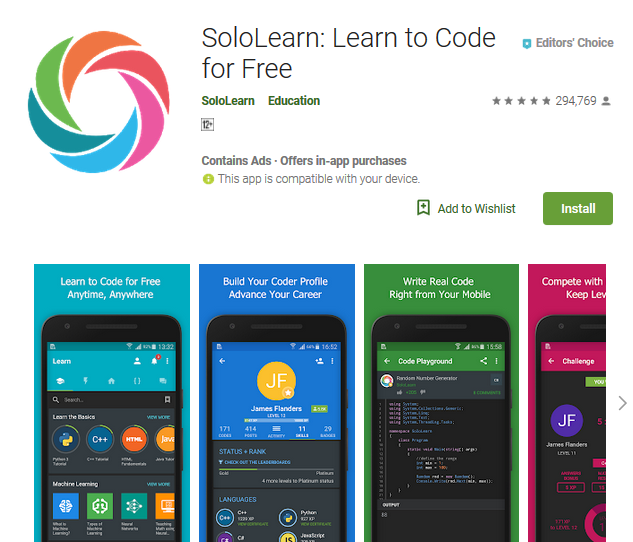 If you are looking for the best free programming app for android phones, SoloLearn should be your top choice. This programming application has the largest collections of free code learning materials that shows you a step by step guide on learning programming. SoloLearn is not just a single app but series of programming apps, each designed uniquely for a specific programming language where you can easily learn programming topics to learn coding skills brushing up your programming knowledge. SoloLearn is Facebook 'FbStart’s App' of the Year 2017 because of their uniqueness and simple ways they teach the basics of coding. This android programming app helps beginners in coding learn programming concepts by going through short lessons and follow-up quizzes in which the student gets scored in order to stay motivated and committed, facilitating an efficient and effective coder skills improvement. 1. Enjoy lots of programming materials - learn Android app development course with simple android app project, C++, Java, Python, SQL, CSS, HTML, C#, and many other programming languages for free. 2. One of the best community of coders, where peer support is an essential part of learning and development with lots of fresh learning materials is created by the community daily. 3. You will get certificate after clearing all the levels, a code playground where you will find several programming topics and assignments. Sololearn app allows users to write and run code using the mobile code editor. Download SoloLearn On Google Play Store. Done with learning programming languages? check our top picks of the best app builder on android which you can download on your mobile phone. While searching the web on how to make an android app for beginners, you probably have come across some websites like appsgeyser.com or andromo.com where you can create android app online. If you are beginner looking for the best app builder 2018 where you can learn how to create an app without coding. With these sites you can learn simple android app projects but in this list, i will give you the best mobile app builder where you can write your programs and make an app on android. 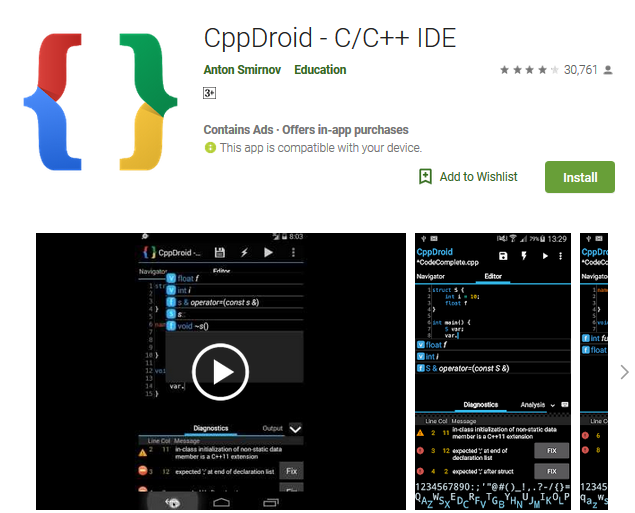 CppDroid mobile app builder is a very popular programming app that has one of the best app builder for C/C++ IDE and compiler on android devices, where you can easily write and run C and C++ programs. The mobile app builder is a good app for beginners and professional C/C++ programmers. Although the CppDriod is free to download on Googles play store, it does have in app features which you will have to purchase. The app is built with a very nice user interface for writing codes and a large collections of programming libraries. Fully write, run code and export your apk. Huge collections of great C/C++ code examples. Configurable auto indentation and auto pairing of codes. Compile C/C++ code without rooting your android phone. Create your app offline with built-in compiler that requires no internet connection. Real-time diagnostics of codes, gives warnings, shows and fixes code errors. Smart syntax highlighting with different configurable code syntax highlighting. 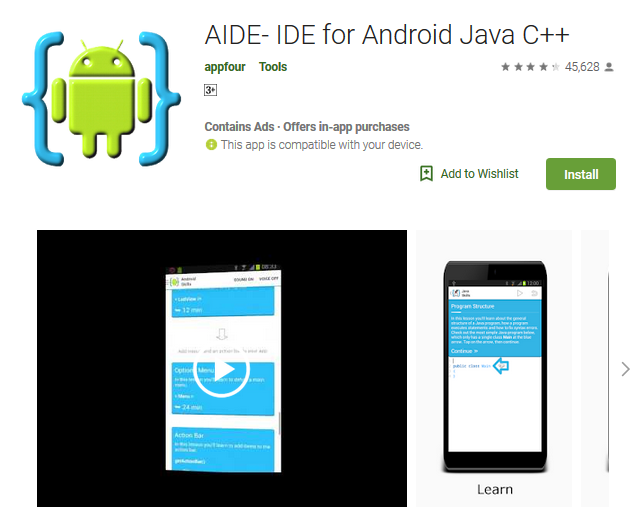 AIDE is an IDE (integrated development environment) an android app development software for creating real android apps directly on your android phone. If you an android developer or java developer looking on how to create an android game or android app, AIDE app builder is the best app for you. How to create an android app for beginners is easy with AIDE as it's provides android app development courses and editable android codes examples that will help beginners build simple android app projects with a easy step by step guide to become an expert android developer. Being the best android studio for android phone, AIDE allows you jump to any line of the code and edit Android Studio/Eclipse projects using your android mobile phones. Easily run and debug app with a single click. Detect errors with real-time error checking and code refactoring. Automatic code completion, syntax highlighting and option to save on Dropbox. Interactive app development courses for Android, Java App and game development. User friendly UI and Multi-Window support mode for Android 7 (Nougat) and above. Download AIDE for free on Google Play store. If you are looking on how to build or edit Python scripts on android, QPython for android is your best choice. This top android programming app comes with an engine that allows you to easily interpret Python codes, edit Python codes, Console, QPYPI, SL4A Library for Android. It can also help programmers develop android application. QPython comes with a complete development kit to help you to develop programs on mobile phone and it provides the regular Python console environment. QPython also comes with loads of other amazing features for android such as QRCode reader etc. QPhython is free to download on the google play store. Run Python scripts via QR code. IDE and Pip (package manager). Run and edit Run scripts / projects. Easy to use Python programming on Android. Smart syntax highlighting, and auto pairing of codes. Run the powerful Python interpreter directly on your Android device. SL4A for Android access for GPS, Bluetooth, network and many more. 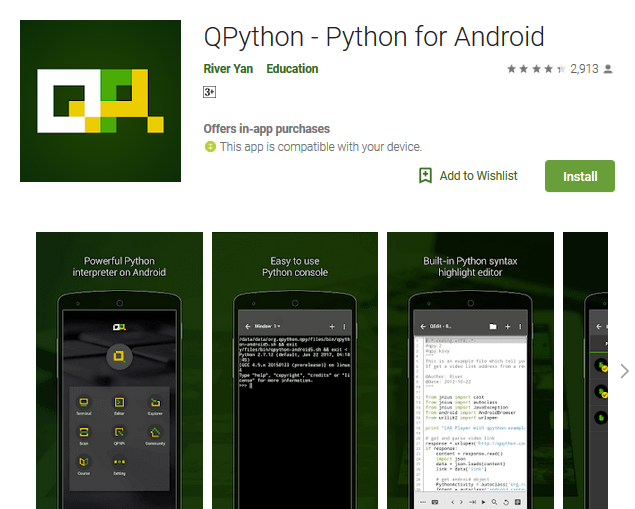 Download QPython for free on Google Play Store. These are the top 6 best programming apps for android which you can use to learn programming on android or create apps on android phone. I recommend you try all 6 and choose the programming app that suits your need. Thanks for reading, our top picks of best android programing apps, if you have any thought or good programming application for android, you think is worthy of this list comment below and don't forget to share this article on social media, if you find it helpful.